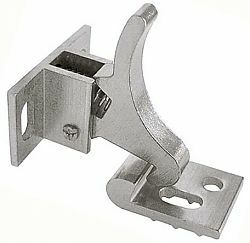 This heavy duty cabinet elbow catch is constructed of solid brass. Both the catch and the strike are slotted to provide adjustment. Strike plate has an extra screw hole to prevent spinning on plastic laminate. Ideal for institutional and commercial cabinets.